The correct tyre pressure is vital for both safety and for extending the life of your tyre. You should check your tyre pressures monthly, including the spare and before any long distance driving. Make sure the tyre pressures match the pressures recommended by the vehicle manufacturer.<br>Tyre pressures should if possible be checked cold. If tyre pressures are checked hot, add 4 to 5 psi (0.3 bar) to the recommended pressures.In the case of unusual pressure loss, the internal and external condition of the tyre should be checked, as well as the condition of the wheel and valve. Maximum grip on the road is vital for road safety. This can only be achieved with the correct pressure in your tyres. The illustration shows how much grip a tyre has on the road depending on its pressure. Under inflated tyres can not only overheat increasing the chances of it bursting, but also lead to poor handling of your vehicle. 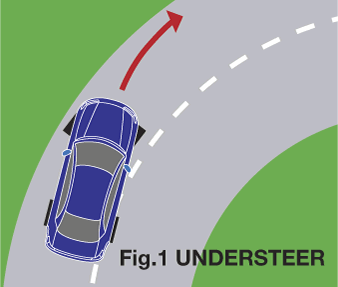 Low pressure on the front axle will increase understeer (fig. 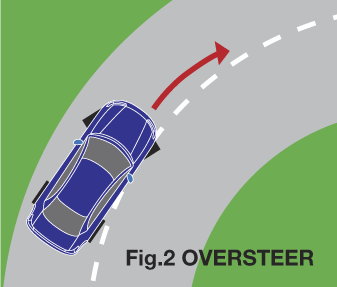 1) whereas low pressure on the rear axle will increase oversteer (fig. 2). Over inflated and under inflated tyres suffer more damage than those with the correct pressure and need to be changed more often. Vehicles with under-inflated tyres have increased rolling resistance that requires more fuel to maintain the same speed.